A photograph of the tulip planting ceremony commemorating the liberation of the Netherlands from German occupation 35 years ago. Taken at City Hall (Winnipeg). 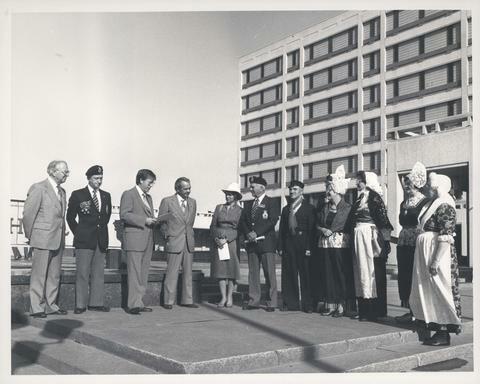 Photograph shows: Don Heyes (Master of Ceremonies), Mayor Bill Norrie, Warner Jorgenson (Minister of Consumer and Corporate Affairs, Province of Manitoba), Ben Van Ruiten (Consul of the Netherlands), and unknown persons.